I agree that Obama inherited a crappy economy, and I think it is silly to assert that he bears any responsibility for the severity of the 2007-2009 recession. But it is very fair to hold him responsible for what’s happened since the recession ended. I’ve cited data from the Minneapolis Federal Reserve on both employment and gross domestic product to show that Obama has presided over the weakest recovery in the post-World War II period. 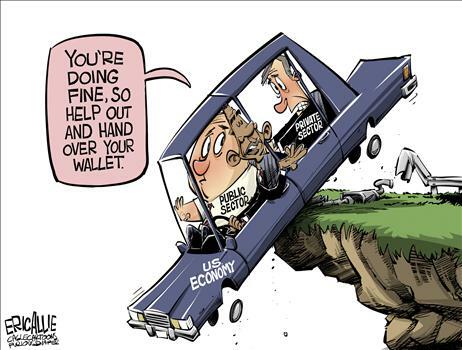 And I think it is fair to blame Obama for the economy’s anemic performance during that time, largely because his agenda of faux stimulus and Obamacare exacerbated the statist policies of Bush. In other words, he promised “hope” and “change,” but delivered more of the same. Well, now that the election is over, even the Washington Post is willing to admit that Obama’s economic performance is dismal. Here’s a remarkable chart showing that growth is far below the average. There are actually two very important conclusions to draw from this chart. First, the economy has not recovered the lost output from the recession, which is a point made by Nobel laureate Robert Lucas. That’s bad news. Second, it appears that the economy is now a lower-growth trend line. That’s worse news. Indeed, I fear permanently lower growth is the legacy of the Bush-Obama years. We now have a substantially bigger burden of government spending, and things will get worse rather than better in the absence of real entitlement reform. And we have a lot more cronyism and interventionism, which undermines economic efficiency. To make matters worse, Obama wants higher tax rates and more double taxation of saving and investment. To be blunt, those are not the policies that create jobs and wealth. Last century, a good rule of thumb was that the United States was about halfway between the high-growth, small-government economics such as Hong Kong and Singapore and the low-growth, big-government economies of Europe. But as we move closer and closer to European-style economic policy, it should be no surprise that we get anemic European-style economic performance. We know the recipe for growth and prosperity. But the political elite is oblivious or doesn’t care. If you want a straightforward measure of Obama’s economic performance, look at the comparative business cycle data from the Minneapolis Fed. If you want to hoist the White House on its own petard, show the Administration’s estimate of what was supposed to happen to unemployment if the so-called stimulus was enacted compared to the real-world results. And if you want to be mean and snarky, share this image from the good folks at Reason (click to enlarge). To be fair, I imagine one could dig up quotes even from the Reagan years that make people look foolish after the fact. Which is why I prefer data rather than quotes. 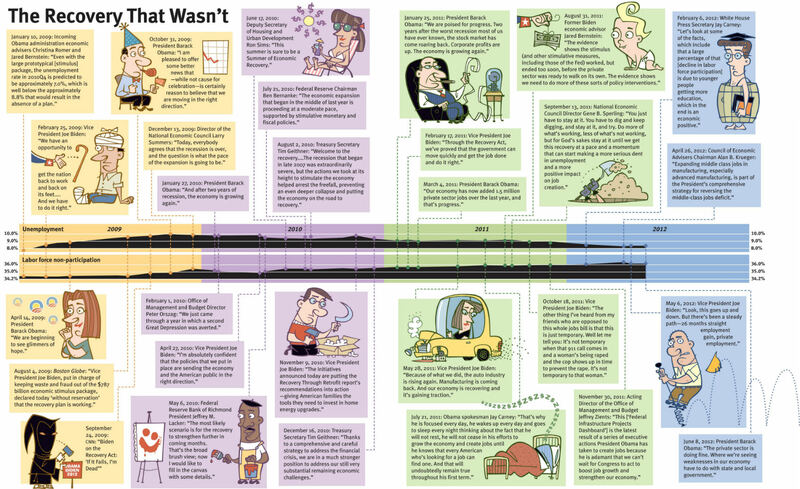 But since I also enjoy mocking politicians, I must admit that this is a great infographic. For what it’s worth, I gave Obamanomics an F in this CNBC debate. But lest anyone accuse me of partisanship, I’ve repeatedly explained that Bush’s performance was equally dismal. It doesn’t matter whether you have an R after your name or a D after your name. If you expand the burden of government spending, the economy isn’t going to prosper. Will the Economy Sink Obama in November? At the start of the year, I predicted Obama would be reelected, largely because of my assumption that the unemployment rate would drop below 8 percent. But my prediction on jobs is looking quite shaky, so this discussion about the economy and the election with Fox Business News is very timely. I argued, unsurprisingly, that the economy is anemic because Obama’s been pursuing an agenda of wasteful spending and class warfare. So if he loses, he has nobody to blame but himself. That doesn’t mean Romney would be an improvement, especially if the warning signs are correct and he saddles the country with a value-added tax, so the American people may be tossed from one frying pan to another. P.S. Hadley Heath may look familiar because she narrated this video about the damaging impact of welfare programs for the Center for Freedom and Prosperity. P.P.S. On the completely separate topic of the Greek elections, I am more peeved than ever that the idiots in the media are reporting the results as a victory for the pro-bailout parties over the anti-bailout parties. That is nonsense. All the parties favored bailouts. As I wrote earlier this year, the election was a fight between parties that want no-strings bailout money and parties that at least pretend they are willing to implement reforms as a condition of getting bailout money. 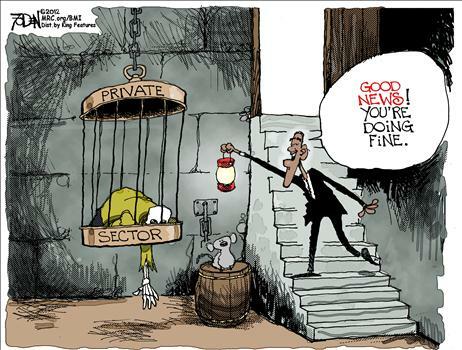 This is a gift to political cartoonists, and they’ve taken advantage of Obama’s daft remark. As best as I can recall, this is my first Glenn Foden cartoon, but it’s a good one. 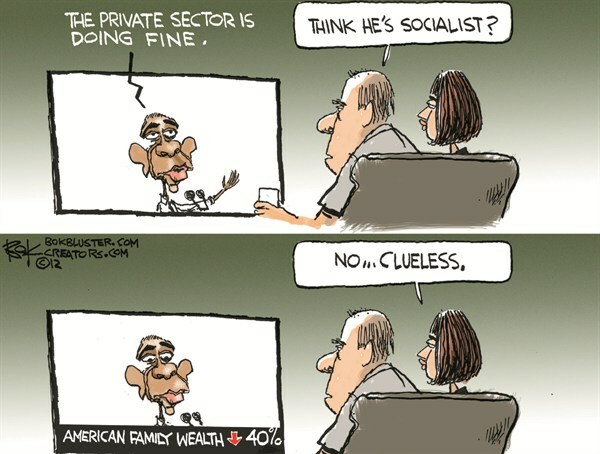 I wrote the other day about the debate on whether Obama’s a socialist. I concluded that it’s best to describe him as a statist, corporatist, or cronyist, but Chip Bok adds another term that might be most appropriate. If you like Chip Bok’s work, I recommend this class-warfare cartoon and this gem about union thuggery in Wisconsin. And Eric Allie makes the very good point that Obama not only screws up the diagnosis, but also offers the wrong prescription. Eric Allie is relatively new to me, but he’s on the right track as you can see from this cartoons about Obama’s counting skills. P.S. If Obama actually wants to fix the economy, I suggest he watch this video tutorial so he can learn that the private sector is suffering because too many resources are being diverted to unproductive uses by the public sector. It seems that any argument about the economy eventually boils down to the core issue of whether government spending acts as a stimulus or whether it is – in the words of Thomas Sowell – a sedative that undermines prosperity. So when Robert Reich and I went on Erin Burnett’s CNN show to discuss Obama’s stumbling economic performance, much of our discussion focused on whether to further expand the burden of the public sector. Here are a couple of observations about the interview. Reich admitted that spending is a problem and in the “long term” needs to be reduced. I suspect “long term” never arrives in Reich’s world, but this is nonetheless a startling concession on his part. Reich claimed World War II was an example of successful Keynesian stimulus, but if he wants to make that argument, then he needs to explain why we didn’t fall back into the Great Depression after the war – which is what all the Keynesians warned would happen. For reasons outlined in my beat-down of Krugman, I’ve become a cheerleader for Estonia and used the interview to promote that country’s fiscal restraint. If you want to understand more about Keynesian economics and why it doesn’t work, this video will be more instructive than my food fight with Reich. P.S. 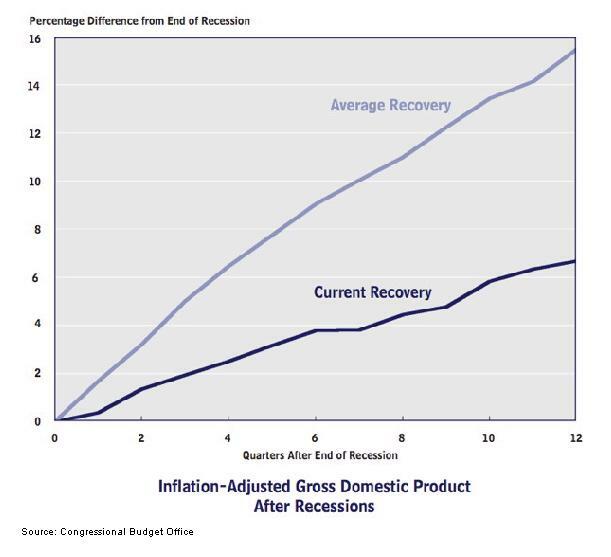 Obama is monotonously repetitive in his claim that the economy is facing headwinds. As this Ramirez cartoon illustrates, he’s right, but not in the way he thinks. Has Obama Made the Economy Better or Worse? I’ve been a big critic of Obama’s policies on taxes, spending, regulation, and intervention, so you won’t be surprised that I argued on CNBC that his policies have made the economy worse. Here are two graphs, which I posted earlier this month, that make my point. The red lines show the economy is finally – and slowly – moving in the right direction, but the blue lines show how the economy boomed under Reaganomics. The gap between the two lines in the charts is a measure of how Obama’s policies have undermined the economy, as I mentioned on the program. However, I also said that this may not matter much this November if Republicans are incapable of making coherent economic arguments. One last thing to emphasize is that Jared resorted to dishonest Washington math when discussing Obama’s make-believe budget cuts. When you use honest numbers, as i did when analyzing the President’s new budget, you find that the burden of government spending is going to climb by $2 trillion between 2012 and 2022.